The C-HR's polarizing design is key to Toyota's love-it-or-leave-it formula for turning heads and breaking the brand's reputation for boring cars. 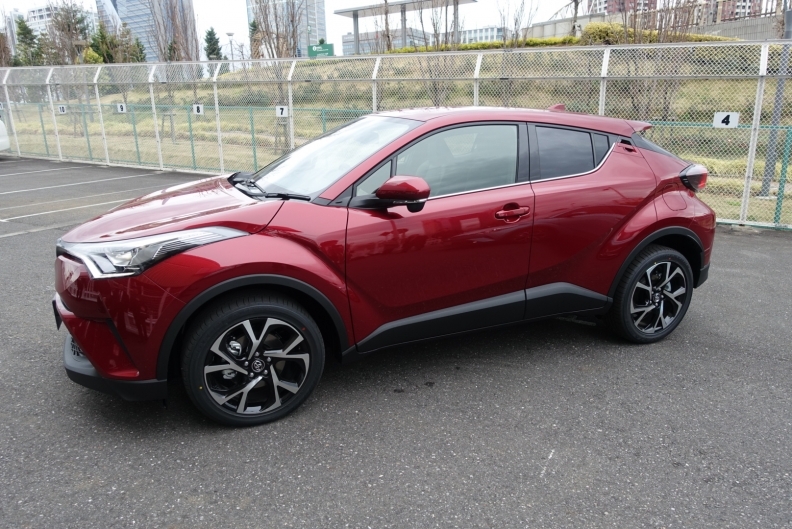 TOKYO -- Toyota was late to the subcompact crossover party, but it wants to take a big bite out of the segment with the bold design and driving dynamics of its in-your-face C-HR. And if the squat, muscular crossover looks too aggressive and wild, all the better. Hiroyuki Koba, general manager of the C-HR, said its polarizing design is key to Toyota’s love-it-or-leave-it formula for turning heads and breaking the brand’s reputation for boring cars. Toyota’s entry, which went on sale in Japan on Wednesday, aims to conquest more than the average 20 percent new-to-Toyota customer ratio achieved by its nameplates, Koba said. Its distinct looks -- starting with is oversized wheels, bulging fenders and radically sloped rear window -- will get it noticed and help drive sales because market research shows design is the top priority of customers shopping in this segment, Koba said at a Tuesday launch event. Toyota expects to sell 170,000 C-HRs a year globally, though Koba declined to give a breakdown for specific markets. The vehicle will go on sale in Europe in January and in the the U.S. next spring. It will be sourced from Toyota’s plant in Turkey, which is expected to build 100,000 units a year. “If you like it, you love it. If you don't like it, you never will,” says Koba. A plant in Japan will manufacture another 70,000, mostly targeting the domestic market. The C-HR goes up against early entrants in the fast-growing subcompact crossover segment, such as the Honda HR-V and Nissan Juke. Koba said the C-HR’s responsive handling puts it more in the league of the Ford Focus and Volkswagen Golf. Indeed, the Japanese carmaker undertook early development of the C-HR in Europe to better tune its driving dynamics to Europe’s winding roads and high-speed highways. Prototypes have been tested around Germany’s Nurburgring race circuit since 2013. “It offers crisp clean driving like a hatchback,” Koba said. The C-HR is being positioned as a global nameplate and will be sold in more than 100 markets. But Japan and Europe are expected to be the volume leaders, Koba said. Hybrid variants, using essentially the same system as in the Prius, will be offered in Europe and Japan. The U.S. won’t get the hybrid for two reasons, Koba said. The first is that cheap gasoline prices make fuel-efficient hybrids a harder sell. The other is that the C-HR was initially planned as an offering for the now defunct, youth-oriented Scion brand, and a hybrid was deemed too pricey. Now that it is being badged a Toyota, the company may reconsider that, Koba added. 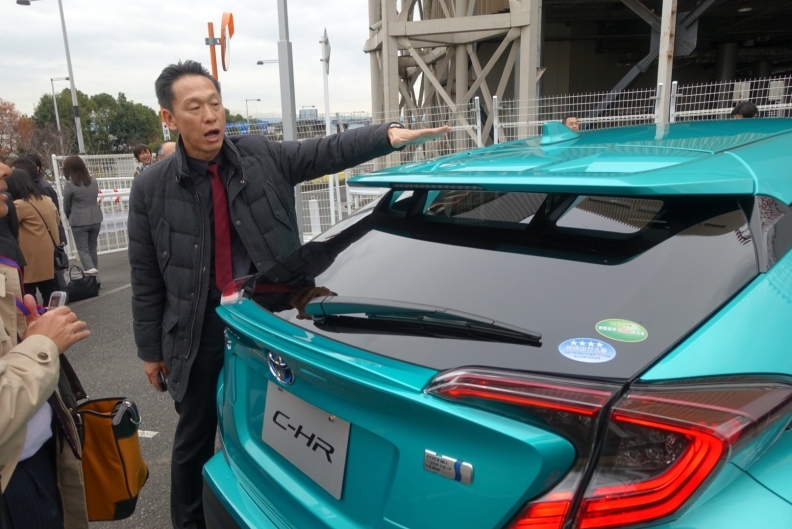 The C-HR is the second nameplate, after the Prius, to ride on the Japanese company’s new modular Toyota New Global Architecture, or TNGA, platform. Most of its underpinnings are shared with the Prius, though Toyota tweaked the undercarriage and suspension in places. Koba acknowledged that the company wanted to bring a subcompact crossover to market earlier to ride the boom. But Toyota had to wait until the TNGA platform was ready.